A pair of one of the best studio monitors is one of the most important recording gear in any music recording studio. They are the definition of “truth and accuracy” as they don’t color sound. If your recording is sounding great on studio monitors speakers, it will sound good anywhere. Producing music involves mixing different instruments and other effects to come up with an ambitious album. Meaningful mixing requires a monitor which you can control its various aspects like the frequencies, sound beats, and any feedbacks. It is therefore not prudent for any serious producer to use the ordinary computer speaker however powerful they may be. When it comes to pricing they are expensive. Some like the Adam Audio A77X 3-Way Active Studio Monitor cost over $2500. 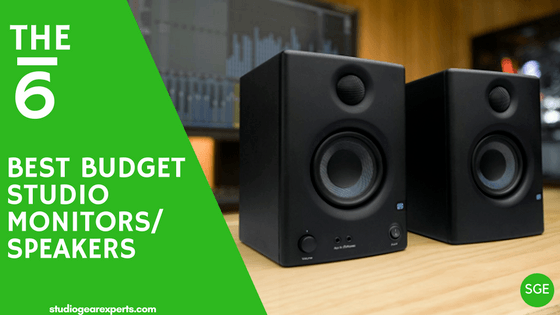 If you don’t have this much to spend, we have identified some of the best cheap studio monitors which we believe are up to task. The last thing you want in your studio work is distortion. Given that this is monitor with powerful sound of up to 120W, there may be presence of destructive noises and feedbacks which is not is not conducive in the studio set up. This monitor gives you undistorted and clear sound. This is due to the presence of bi-amps and to create a more extensive headroom for minimizing distortion. It also has a tweeter sieve the sound giving your clarity. The Manufacturing Company has a record of producing quality studio monitors. This is due to their continued advancement and user-friendly designs when it comes to their products. This means you have enough trust in the history of the parent's company products. You are able to experience a personalized taste of the monitor output. It is designed to allow adjustment of the frequencies to give a user convenient sound. In addition to this, it is well optimized to provide you (the user) with a high-level imaging ability. It is only fair to describe this monitor as one of the best professional's music maker's choice for the studio. This is because it is very famous and used is in many studios by professional. This widespread acceptance can be attributed to its ability to give a noise-free output, lightweight nature and very affordable. If you need the best recording environment, JBL LASR305 is the monitor to look for.it gives you such a convenient situation that even the minute details of the recording can be heard without strains. Even with a deep and loud instrument, you can customize the frequencies to get the final output to your convenience. An extensive headroom is critical in reducing distortion instances. This monitor has an ample headroom such that you can adjust the mixes from a distance. The amplifiers allow the monitor to deliver excellent output. The sound can be regulated to fit the user's convenience. This is to mean one can customize the music to that which meets their convenience. The monitor gives a tight bass and at the same time very clear sound. This is due to the high-performance woofer which provides the mid-range bass and tweeters to sieve the sounds. To add on this, the monitor is compatible and connectable to multiple inputs for sound and music mixing. Just like most monitors for studios, this too has a right imaging control. This is the ability to hear the different aspects of the recordings critically. You can, therefore, control the way the sounds are being mixed to give out a satisfying audio output. Despite having very advanced music production features, this monitor is very affordable. In fact, it is among the cheapest monitors for the studio on the markets. This combination of quality performance and affordability is one of the reasons why it cut through our picks for this cluster. •Allows mixing and controlling the recording process event from a distance, i.e., you will not have to stay at the sound mouth of the monitor to record effectively. Get yourself a monitor that controls your room response and feedback. This is to mean that Yamaha HS5 is able to control the frequencies to give you a good moderation recording ambiance. A sound recording environment is that which is free of distortions and unnecessary vibration. This is precisely what this monitor delivers. It isolates sound from noise allowing quality recording. The sound output is powerful with fantastic clarity. Despite having deep bass from the high-performance woofer, it has sieved sound by the tweeters. This makes it possible to hear even the very minute details of the recordings. The inbuilt amplifiers also allow controlling the sound output such you only get it just as you want it.The next generation form of music production is the ability to customize the music work to fit different users' convenience. This monitor can, therefore, be described as next generatio0n monitor. This is because one is able to tailor the frequencies to get just the kind of music they want. When music equipment is mentioned, most likely Yamaha is the company that will company that will come into your mind. This is due to the company's continued production of superior and genuine products. The company produces a variety of audio devices that are compatible with each other. This means despite being served with unmatched confidence when buying this product; you are assured that the monitor will be compatible with a variety of audio inputs. In music recording and production, mixing is the most critical process. This monitor gives you a chance to creatively mix your music work like a professional. That is, it creates a right environment for you to do your recording and mixing. It has a very accurate noise reduction unit and very effective mix adjustment features. This means that you can be able to hear even the subtle parts of your records. Other than giving you a well moderate ambiance, it also gives you a powerful sound. Great sound is an excellent ingredient to excellent music output. The monitor, therefore, gives you a tight bass which has been sieved of vibration to provide exceptional clarity. As far as imaging is concerned, you are able to track your recording more deeply. Before buying any musical instrument or gadgetry, it is essential to know how well it will connect to other inputs. Music is never complete in isolation. A combination of different inputs gives out quality output. This monitor easily connects to different inputs hence possible to easily synchronize with different systems of music. One of the reasons we considered this monitor for studio works is its connectivity to multiple inputs. As long the 3.5mm output or the Standard RCA output, it will readily connect. It is also very possible to connect more than one devices simultaneously. While doing this, there is no switching or tiresome plugins needed. You cannot isolate good music from a quality sound. You are therefore needed to have a monitor that delivers quality sound for you to produce competitive music work. This monitor delivers the excellent sound of deep bass sieved off any distortions and vibrations. The sound is highly adjustable using a remote control. This means that you can control the sounds to your convenience with having to move to the monitor. When designing your studio, you wouldn't want to bring along equipment with turn-off designs. You will, therefore, look for those with classy designs. Edifier Speakers are of a classic look with a fancy wood finish. This is due to the vinyl material on the wood to give it a fantastic look in any form of décor. I picked on this monitor as one of the best cheap studio monitors due to its clarity and affordable pricing. It is fitted with two amps to increase the sound quality and reduce audio distortion. Despite being clear, the sound is of deep bass with a sound power of up to 50 Watts. The high-performance woofers facilitate the deep bass. To extend the monitors responsiveness and clarity, it is fitted with one tweeter. Though tight bass might be fancy, it might be so convenient for studio recording. One needs to get the wordings of the sound. You are therefore able to have a sieved hearing with an evident isolation of different sounds. Another useful aspect of this monitor is its broad connectivity base. It is connectable to all devices with quarter jack, RCA, and XLR connection. This is almost universal form connectivity as most audio devices are of this form. This makes it one of the best monitors for studios recording for different instruments effects. To avoid vibration of the monitor due to the bass effect on the surface, it is padded with foam. This ensures that the surface contact to the monitor is cushioned well for effective sounding. To add to this feature, it is very portable. It weighs approximately 5.9 Kgs which is considerably lightweight. Chances of losing it fast due to damages or wearing out are limited as its exterior casing is very durable. The link between good music and the type of monitor used during production is thick. It is an undeniable that there is no excuse for bad music especially if you are doing commercial music. You can’t run away from investing in good studio speakers. In light of strained budget therefore, your basket of choices is also restricted. This budget strain usually happens to beginners in music production. But that should be least of your worry. We have gathered the details and features of some of the cheap monitors for studio for you. In this article we have made it easier to select a monitor that best fits your requirement even with a bottle-necked budget.